North Stradbroke Island residents may notice fire appliances leaving the island this afternoon. This follows overnight patrols to ensure any hotspots/flare ups within the burnt out area of the recent fire were extinguished. The reins have now been handed over to QYAC Rangers and Queensland Parks and Wildlife Service, who will work jointly to monitor the area for the next week. Island residents may experience some intermittent electricity outages as Energex removes its temporary generators on Sunday. Beach access via the causeway at Main Beach is now open. Redlands Coast disaster website: http://disaster.redland.qld.gov.au (includes multi-agency and Council information). The Disaster website and Council social media is also accessible from Council’s website: www.redland.qld.gov.au. With heavy rain and decreased fire activity the Local Disaster Coordination Centre (LDCC) will close at 7pm tonight. A Disaster Planning and Operations team will continue to monitor the situation on North Stradbroke Island from Redland City Council offices. The Community Information Hubs at Dunwich Community Hall on North Stradbroke Island and Russell Island Recreation Hall will both close at 6pm tonight (Wed 5 Dec) and are not expected to reopen tomorrow. Residents and visitors are asked to stay alert and listen to messaging. There is no active fire front however the fire will continue to smoulder in the south-eastern end of the swamp over the next week. Winds have picked up and are expected to continue into the evening. A fire ban remains place for Redland City until 11.59pm today. All internal walking tracks in national parks closed, Tripod Track from Amity turnoff to Alfred Martin Way closed, Alfred Martin Way near the golf course to causeway closed. Since last Wednesday 3200 hectares have burned from the causeway, 22km along the eastern coast of the island to the south. Thank you to the more than 250 firefighters, police and support crew from QFES, Redland City Council, Quandamooka Yoolooburrabee Aboriginal Corporation, National Parks and Wildlife Service, Energex, Sibelco, Seqwater and firefighters from South Australia, Tasmania, Western Australia and Victoria who have worked tirelessly on this fire. Redlands Coast disaster website: disaster.redland.qld.gov.au (includes multi-agency and Council information). Main Beach is closed for swimming again today. Check out our other beaches such as Cylinder Beach and remember to always swim between the flags. There continues to be no active fire fronts (fire moving out of containment lines and into new vegetation), however there are flare ups within the boundary of the containment lines. All fire is back from the burnt out area. Fire at the south-east is also burning against itself. A fixed wing aircraft will assess the situation this morning and water bombing will be undertaken if needed. There is no immediate threat to townships on the island or at the nearby Southern Moreton Bay Islands, including Russell Island which is the closest other island to the fire. Winds are expected to pick up from around lunchtime today and continue into the evening. Fire in the swamp sits between the water and top of the reeds and could be there for some time. Wind is currently south easterly heading towards the north west. Community hubs are open for the final day today from 8am-6pm at Dunwich Community Hall (Ballow Road) at North Stradbroke Island and Russell Island Recreation Hall (Alison Crescent) unless there is a change in the fire situation. A fire ban is in place for Redland City until 11.59pm today. Closures: All internal walking tracks in national parks closed, Tripod Track from Amity turnoff to Alfred Martin Way closed, Alfred Martin Way near the golf course to causeway closed. Since last Wednesday more than 3200 hectares have burned from the causeway to the south of North Stradbroke Island. More than 250 firefighters, police and support crew from QFES, Redland City Council, Quandamooka Yoolooburrabee Aboriginal Corporation, National Parks and Wildlife Service, Energex, Sibelco, Seqwater and firefighters from South Australia, Tasmania, Western Australia and Victoria have been fighting the fire. There are no active fire fronts on North Stradbroke Island. There are still hot spots within the containment lines but these are being closely monitored and extinguished. However, winds are expected to increase across Wednesday so please continue to remain vigilant and listen to messaging. There is also a possibility the fires may reignite in the swamp over the next week. There will also continue to be smoke due to smouldering in the burnt out areas and this is likely to last for a week or more. Two choppers are currently water bombing an active 110m fire front at the southern end of the Straddie fire assisting crews on the ground. The slow moving fire is heading in an easterly direction, with the wind also being helpful blowing the fire back on itself. This video is of a large aerial tanker bombing the fire yesterday. There has been good progress with fire fighting efforts on North Stradbroke Island, however the fire is still burning, with more than 3185 hectares burnt since last Wednesday. Water bombing is continuing today. There are no immediate threats to townships at North Stradbroke Island. Main Beach is closed for swimming again today. Walking tracks in national parks on the island remain closed. Community information hubs are open today until 6pm at the Dunwich Community Hall (Ballow Road) on Straddie and also at nearby Russell Island at the Russell Island Recreation Hall (Alison Crescent), near the ferry terminal. Wind conditions are expected to remain light today before picking up again on Wednesday. The wind is currently moving in a north westerly direction. Smoke will continue to move across North Stradbroke Island and the Southern Moreton Bay Islands. Residents and visitors are reminded to stay vigilant. With wind predicted to pick up on Wednesday there is the possibility that fires inaccessible to ground crews could reignite. Fire ban remains in place across all of Redland City until 11.59pm Wednesday 5 December. Fighting this fire has been a combined effort with crews from Qld Fire and Emergency Services, Redland City Council, Quandamooka Yoolooburrabee Aboriginal Corporation (QYAC) and Queensland Parks and Wildlife Service joined by firefighters from Victoria, Tasmania, Western Australia and South Australia. More than 80 residents attended a community meeting at Dunwich yesterday afternoon where they got an update on the latest information on the fire from emergency services representatives and Redland City Council. Consider finding your essential items (e.g., identification documents, prescription medication, food and water, and protective clothing) in case you need to leave. The Disaster website and Council social media is also accessible from Council’s website: redland.qld.gov.au. North Stradbroke Island residents have again joined a community meeting at Dunwich for an update on the fire burning on the eastern and southern parts of the island. About 80 residents heard from representatives from agencies working collaboratively to control the fire and keep the community safe. QFES, Redland City Council, Quandamooka Yoolooburrabee Aboriginal Corporation (QYAC), Queensland Parks and Wildlife Service, Seqwater, Energex and Sibelco were in attendance as well as Police and SES. Redland City Mayor Karen Williams thanked firefighters from Queensland, South Australia, Western Australia, Victoria and Tasmania as well as all other agencies and volunteers for their contribution in bringing the bushfire under control and within containment lines. News was primarily good with no active fire fronts north of Enterprise Mine and the wind dropping off considerably. It is expected to remain light throughout tomorrow (Tuesday) before picking up again on Wednesday. With the wind direction changing to easterly, smoke will move west across the Southern Moreton Bay Islands (SMBI) and mainland Redlands Coast. Residents should continue to protect themselves from the smoke by closing their doors and windows, keeping medication close by and driving with caution in low visibility conditions. Lighter wind and much reduced fire fronts mean embers are unlikely to affect the SMBIs over the next 24 hours. But residents and visitors are reminded to stay alert. With wind predicted to pick up on Wednesday there is the possibility that fires inaccessible to ground crews could reignite. Water bombing is expected to continue tomorrow and a fire ban remains in place across all of Redland City until 11.59pm Wednesday 5 December. The two community information hubs at Dunwich Community Hall, Ballow Rd, North Stradbroke Island and Russell Island Recreation Hall (near the ferry terminal) will open again tomorrow from 8am to 6pm. Listen to your local radio station or follow Council or QFES’s digital media sites. New Redlands Coast disaster site – disaster.redland.qld.gov.au (also available through Council’s website). More tips on staying healthy in smoky conditions can be found at on the Queensland Health website. Map shows fire as at 5.15pm, Monday 3 December. Black hatched area is the burnt area and red are active fires. There has been good progress with fire fighting efforts on North Stradbroke Island, however the fire is still burning. Two air drops of 11,000 litres of fire fighting foam have assisted in supressing an area of fire travelling west. The fire has burned more than 2300 hectares along a 22km stretch of the eastern side of the island. There is a small fire front south of Enterprise Mine, which is expected to be contained as it moves towards a backburned area. Wind is currently south-easterly (blowing towards the north-west) and is expected to move to an easterly (blowing towards the west) later this afternoon, currently forecast for about 4pm. This will bring increased smoke across the Southern Moreton Bay Islands (SMBI) and mainland Redlands Coast as well as across Brisbane. 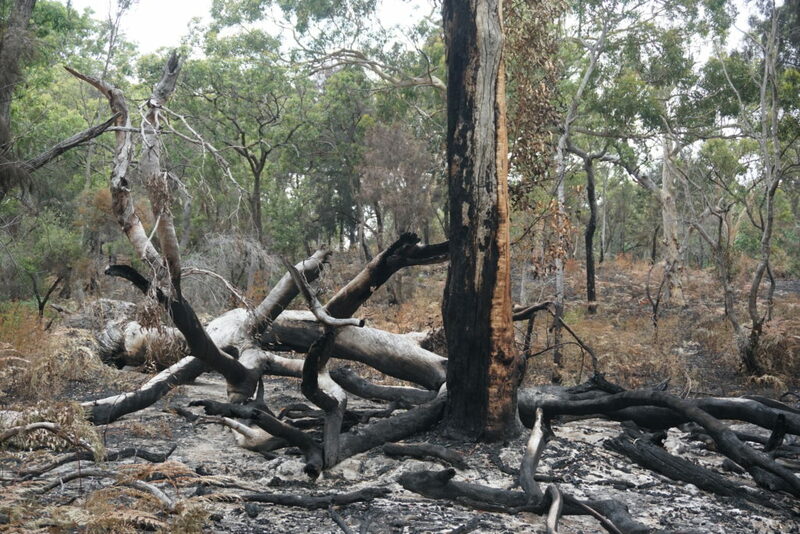 Fire spotting hazards remain a consideration for Southern Moreton Bay Islands. 5 helicopters continue water bombing efforts (4 water bombers and 1 observation aircraft). Closures: Main Beach is closed to swimming and all internal walking tracks in national parks on NSI are also closed – south of Alfred Martin Way near the golf course (the causeway) and Fisherman’s Track (a 4WD track) closed. There are no fires on the Southern Moreton Bay Islands. A fire ban remains in place across all of Redland City until 11.59pm Wednesday 5 December. Community meeting at 4pm today at Dunwich Community Hall (Ballow Rd) and information hub at the hall today until 6pm and tomorrow from 8am to 6pm. Members of the public have been attending the information hub at Russell Island Recreation Hall near the ferry terminal. Russell Island is one of four Southern Moreton Bay islands along with Macleay, Karragarra and Lamb islands. Fire burning since Wednesday last week after dry lightning strike, started in the inaccessible 18 Mile Swamp, on the eastern side of the island. Same location as the December 2013 to January 2014 fire that resulted in resident evacuations and went on to burn more than 70 per cent of the island. Representatives from QFES, Qld Police, Redland City Council, Energex, Queensland Health and Quandamooka Yoolooburrabee Aboriginal Corporation (QYAC) and Seqwater will provide the latest information at the meeting. There are over 40 firefighters from QFES on the ground. Redland City Council, Quandamooka Yoolooburrabee Aboriginal Corporation (QYAC), Queensland Parks and Wildlife Service, Seqwater, Energex and Sibelco are in attendance as well as Police and SES. New Redlands Coast disaster site (also available through Council’s website). Other tips for dealing with bushfire smoke can be found on the Queensland Health website. Surf Life Saving Queensland has closed Main Beach on North Stradbroke Island due to dangerous surf conditions. #UPDATE – Lifeguards at Main Beach #NorthStradbrokeIsland have #closed the beach due to dangerous surf conditions. Please stay out of the water. Two additional large fire breaks are being constructed as a precaution – new fire breaks in the area from Enterprise Mine west across the island. Water bombing continues today, but no backburning due to change of wind direction with wind blowing from the south-south-east. This brings increased smoke across Dunwich, Southern Moreton Bay Islands and mainland Redlands Coast as well as across Brisbane. Concern for SMBIs and Dunwich is the increased smoke with wind changes. On Wednesday winds are forecast to pick up again, after forecasts of reducing winds a little tomorrow (Tuesday). Since starting it has now travelled around 22km south along the eastern side of the island. Community meeting at 4pm today at Dunwich Community Hall (Ballow Rd). Dunwich Community Hall (Ballow Rd) will also become an information hub today from midday to 6pm and 8am to 6pm tomorrow (Tuesday 4 Dec) – a place people can drop in for the latest information, staffed by Council. Russell Island Recreation Hall (1 Alison Crescent), near the ferry terminal, will also become a community hub today from 8am to 6pm. All campers have been evacuated from Main Beach and camping bookings for that area have been suspended by Minjerribah Camping. Closures: Main Beach has been closed south of Alfred Martin Way (the causeway) and Fisherman’s Track (a 4WD track) has also been closed. There are approx. 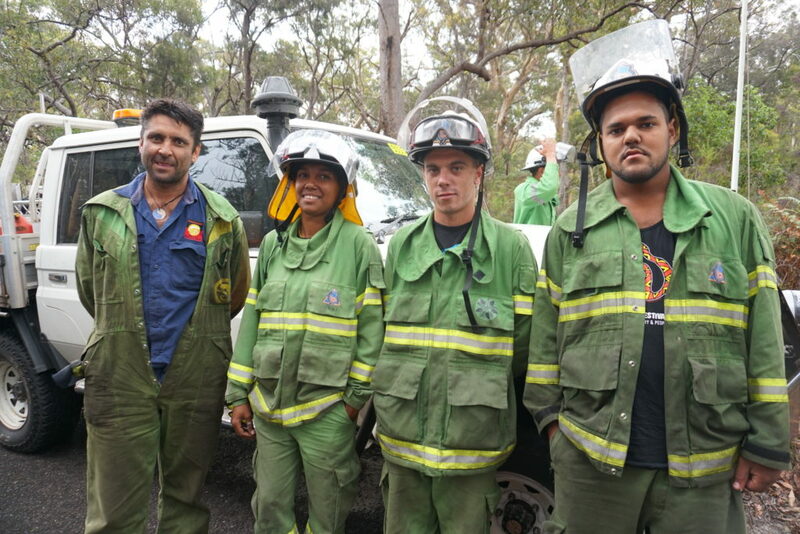 60 firefighters from QFES, Redland City Council, Quandamooka Yoolooburrabee Aboriginal Corporation (QYAC), Queensland Parks and Wildlife Service, Seqwater and Sibelco in attendance as well as Police and SES. On Saturday there were firefighters from South Australia and yesterday (Sunday) we also had fire fighters from Tasmania. Overnight the wind changed from blowing from the north to the south to now blowing from the south to the north. This increases the amount of smoke affecting Dunwich and the Southern Moreton Bay Islands (SMBI), especially Russell Island. New Redlands Coast disaster site – redland.qld.gov.au (also available through Council’s website). Hear the latest update about the North Stradbroke Island fire and smoke drifting over to the SMBI’s from Mayor Karen Williams and Queensland Fire and Emergency Services – QFES Acting Inspector Damien Thomas. Live aerial footage of the fire burning at North Stradbroke Island from ABC Brisbane. Water bombers are working hard to extinguish the fire. LIVE NOW: The news chopper has been up to check out that bushfire burning on North Stradbroke Island 🔥Queensland Fire and Emergency Services – QFES is worried about wind changes early on Monday they say will increase smoke and fire spotting hazards for the southern Moreton Bay Island, especially Russell Island. Residents and visitors to North Stradbroke Island can drop in at any time during these hours to find out that latest about the fire that has burned on the island at 18 Miles Swamp since Wednesday. It will be staffed by Redland City Council officers. A community meeting will be held at the hall tomorrow from 4-5pm. Currently telling residents on Macleay Island to expect increased smoke on the SMBIS from the Straddie fire due to a predicted wind change. Some residents at the Macleay Island community meeting ask about the emergency alerts sent out this morning. Residents are told to ensure they have location services to make sure they receive the alerts. That wraps up the Macleay Island meeting. Stay up to date with the latest on Council’s website and social media pages. A Straddie community meeting will be held tomorrow (Monday 3 December) at the Dunwich Community Hall (6 Ballow Road) from 4-5pm to provide an update on the fire that has been burning on the island since Wednesday. Representatives from Emergency Services including Queensland Fire and Emergency Services – QFES and Queensland Police Service, Redland City Council, Queensland Health and Quandamooka Yoolooburrabee Aboriginal Corporation will provide the latest information at the meeting. This is the second community meeting held on the island about the fire, with the first held at Dunwich on Friday, 30 November. Residents are advised to keep updated with community messaging. The impact of smoke from a fire burning at North Stradbroke Island is likely to increase on the Southern Moreton Bay Islands over the next few days. There are no immediate threats to townships. Probable changes in wind direction throughout Sunday and Monday are likely to increase smoke and fire spotting hazards for the Southern Moreton Bay Islands (SMBI), especially Russell Island. To update on the community on dealing with potential smoke hazards, community meetings will be held today on Russell and Macleay Island hosted by the Queensland Minister for Health, the Hon. Craig Crawford MP, and representatives from QFES and Queensland Health. Macleay Island at 4pm at the Rural Fire Station located at Lot 2 High Central Road, Macleay Island. Smoke may also affect South Stradbroke Island and the southern part of Redlands Coast mainland. SMBI residents, especially the elderly and those with respiratory illness, should stay alert and take precautions to avoid the effect of the increased smoke hazards. Those with respiratory conditions might consider leaving the islands before the wind change. The Rural Fire Service has been activated on SMBI. The fire is currently south-east of Enterprise Mine.Water bombing and backburning continue on North Stradbroke Island today. Firefighters continue to strengthen containment lines and aerial operations are assisting. A fire ban for Redlands Coast has currently been extended until 11.59pm on Wednesday 5 December. It is possible it will be extended.To report any wildfires call 000. Protect yourself from smoke using these tips from Queensland Health. individuals who are particularly sensitive to smoky conditions should consider temporarily moving away from the smoke-affected area and staying with a friend or relative. A fire continues to burn at 18 Mile Swamp, near Blue Lake, in a southerly direction. There are no immediate threats to townships. The Bureau of Meteorology has forecast an expected wind change early tomorrow morning (Monday 3 December 2018). Wind is expected to blow north towards Dunwich initially in the early hours of tomorrow morning, bringing increased smoke to the township. Another wind change is then expected by the early afternoon tomorrow, with the wind then coming from the east blowing smoke towards the west coast of the island. Winds blowing to the west coast of the island will mean an increase in smoke blowing over the Southern Moreton Bay Islands and southern mainland Redlands Coast by early afternoon tomorrow. The fire is currently south-east of Enterprise Mine. Water bombing and backburning continue today. A fire ban for Redlands Coast has currently been extended until 11.59pm on Wednesday 5 December. It is possible it will be extended. All internal walking tracks within national parks on the island are temporarily closed due to the risk of wildfires. Exercise caution when travelling around the island and do not enter closed areas. Do not ignore road closures signs. It is unlawful and dangerous to do so. To report any wildfires call 000.